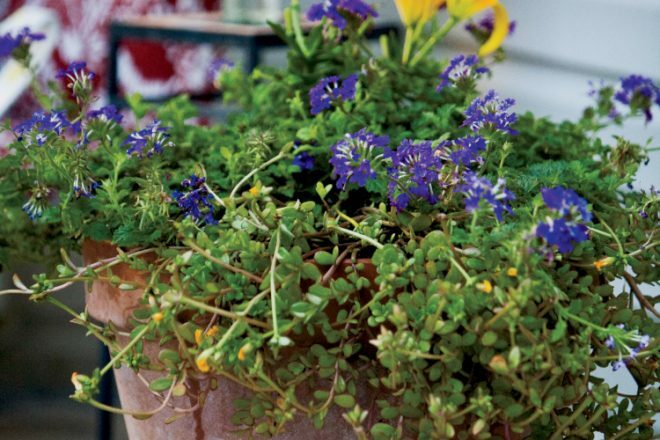 Plant a gorgeous container garden this year. You can grow almost anything in a container and use almost anything for a container. First decide where to put your container – on the porch, patio, deck or by the front door. Then, choose the size and type of pot. Will it be an inexpensive terra cotta? Heavy, durable concrete? A colorful ceramic? A lightweight plastic or wooden whiskey barrel? Any of these will work! To prepare a successful pot, you must use good potting soil. Never use garden dirt or reuse old potting mix. Try a coffee filter, landscape fabric or piece of window screen over drainage holes to keep the soil in the container. Your container must have drainage holes in the bottom of the pot to drain excess water. For containers that are 3 gallons or larger, use “pot feet” to provide an open space from the bottom of the pot to the ground to let excess water drain. If you don’t have drainage holes, roots can become water logged and your plants will die. For container gardens, you must keep the plants well hydrated. Be sure to water them every day or add watering aids such as water-absorbing crystals and soil moist mats, or use self-watering containers. Now comes the creative part. Select your plants with an eye to color combinations, texture and same light/water requirements. To help with container garden aesthetics, remember three words: hill, fill and spill. You need a tall plant (hill) that is at least one foot taller than the height of the container. Fill the middle with plants that have a mounding or bushy habit. “Spill” low-growers with a trailing habit over the edge of the container like a vine. Your new container will enhance the chosen area with color and life. 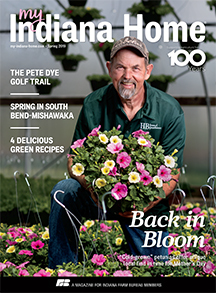 Don’t be afraid to trim vines or flowers, or to switch out plant material when the season changes. Plant a beautiful container garden and enjoy the praise.